Wembley Park is a London Underground station in Wembley Park, north west London. The station is served by the Underground's Metropolitan and Jubilee Lines and is in Travelcard Zone 4. 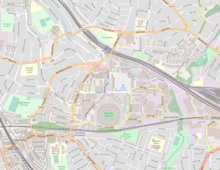 It is located on Bridge Road (A4089) and is the nearest Underground station to the Wembley Stadium and Wembley Arena complex. This is where the Jubilee line from Stanmore diverges from the Metropolitan line which was formerly a branch of the Metropolitan Railway and was taken over by the Bakerloo line and today part of the Jubilee line. The station currently has six London Underground tracks, with the two Jubilee line tracks in the centre flanked in turn by the Slow and Fast (outermost) Metropolitan line tracks. Fast trains call at the station only during off-peak periods (Northbound during the morning peak and southbound during the evening peak). Both Metropolitan and Jubilee line trains may start or end their service at the station. Jubilee line trains that terminate at Wembley Park reverse via sidings between the running lines to the north of the station. Meanwhile, Metropolitan line trains that terminate at Wembley Park use the fly-under and Neasden depot to reverse. The frontage of the station building is an Italianate design from the early 20th century. However, because of the extensive use of the station the layout has been altered many times since. Behind the frontage are passages above track level with staircases leading down to the platforms, constructed in the 1940s in the red-brick modernist style of the period. Parts of the platforms were rebuilt in the 1940s and then the 2000s, which also added the current entrance to the west of the station towards the stadium. Until 1880 the Metropolitan Railway (MR) line out of London only ran as far as Willesden Green. 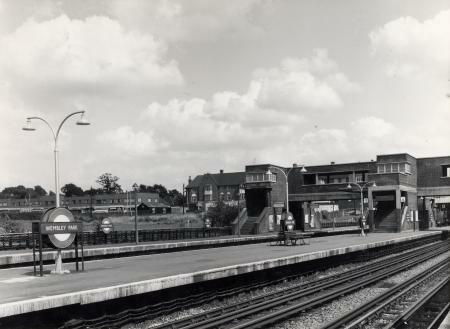 In early 1879 work began to build an extension to Harrow-on-the-Hill, with one additional station at Kingsbury and Neasden. Services to Harrow started on 2 August 1880, extending the MR route (today's Metropolitan line) into Middlesex. At this time Wembley was a sparsely populated rural area which did not merit the construction of a railway station and MR trains passed through without stopping. In his 1973 BBC documentary Metro-land, Sir John Betjeman remarked, "Beyond Neasden there was an unimportant hamlet where for years the Metropolitan didn't bother to stop. Wembley. Slushy fields and grass farms." However the then chairman of the MR, Edward Watkin, was an ambitious businessman who sought new ways of attracting paying passengers out of London and onto his railway, and he regarded the barren lands of Wembley as a business opportunity. In 1881 Watkin purchased large tracts of land close to the MR line and began a grand scheme to build an amusement park at Wembley, laid out with boating lakes, a waterfall, ornamental gardens and cricket and football pitches. The centrepiece of this park was to be a soaring metal tower, known as Watkin's Tower; at 1,200 feet (366 m) it was to be taller than the Eiffel Tower and would offer panoramic views of the surrounding countryside, just 12 minutes from Baker Street station. 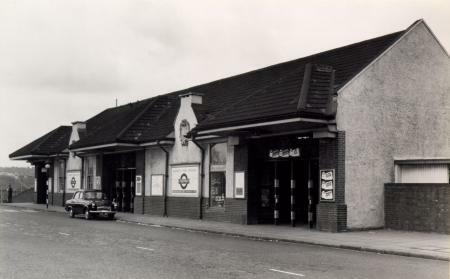 Wembley Park station was specially constructed to serve these pleasure grounds as a destination for excursion trips on the company's trains. The station opened for the first time on 14 October 1893 and initially operated to serve only Saturday football matches in the park. It opened fully on 12 May 1894. Watkin confidently anticipated that large crowds would flock to the park and the railway station design incorporated additional platforms to handle large passenger numbers. Watkin's Tower ran into structural and financial difficulty; it was never completed and the partially built structure was demolished in 1904. Despite this, Wembley Park itself remained a popular attraction and flourished. Later in the 1890s, the Great Central Railway's (GCR's) London extension was constructed adjacent to the MR's tracks. The tracks pass under the entrance building but the station has never been served by main line operators. In 1905 the tracks were electrified and the first electric trains became operational. Between 1913 and 1915, the MR added additional tracks to double the line's capacity. 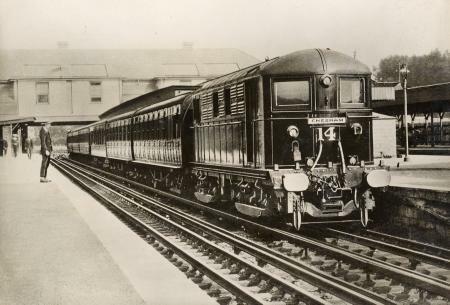 On 10 December 1932, the MR opened a branch line north from Wembley Park to Stanmore. From 1915 the MR began a programme of selling off its surplus land holdings in Buckinghamshire, Hertfordshire and Middlesex for suburban housing development. Its Metropolitan Railway Country Estates Limited marketed areas such as Wembley Park under the "Metro-land" brand, promoting modern homes in beautiful countryside with a fast railway service to central London. The MR sold the park land at Wembley when the site was selected to host the 1924 British Empire Exhibition and the grand British Empire Exhibition Stadium constructed for this event was later to become Wembley Stadium, the home ground of the England national football team. Originally, the MR served all stations south from Wembley Park to Baker Street station but the line suffered from congestion due to limited capacity on the tracks heading into Baker Street. Following the combination of the MR and London's other underground railways to form the London Passenger Transport Board (LPTB) in 1933, the LPTB took steps to alleviate the congestion by constructing new Bakerloo line tunnels from Baker Street to connect to the Metropolitan's tracks south of Finchley Road station. From 20 November 1939, the Bakerloo line then took over the Metropolitan stopping services between Wembley Park and Finchley Road and the Stanmore branch. To handle the exceptional passenger numbers associated with the 1948 Olympics held at Wembley Stadium, the original station building was extended and given a new ticket hall and additional circulation routes and platform stairs. 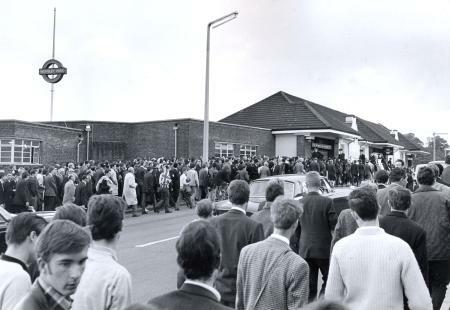 At the opening of the Jubilee line on 1 May 1979, the Bakerloo service from Baker Street to Stanmore was transferred to the new line. When the UEFA European Football Championship was held at Wembley in 1996, a large staircase was constructed leading down from the 1948 extension and under the newly built Bobby Moore Bridge, which had opened in 1993. This was intended as a temporary structure and remained in its unfinished state until 2004, when extensive work began on the station in conjunction with the reconstruction of Wembley Stadium. Additional facilities were provided to handle event crowds, and the staircase was completed in time for the opening of the new stadium in 2007. London Buses routes 83, 182, 206, 223, 245 and 297 serve the station. The proposed West London Orbital would call at this station. The underground railway would run between Brent Cross and Surbiton. The railway is still on the proposal stage and is not approved or funded at present. The Fastbus is also a proposed limited-bus service running from Wembley Park to North Acton. ^ Horne, Mike (2003). The Metropolitan line. Capital Transport/London Transport Museum. p. 13. ISBN 1854142755. ^ Betjeman, John (2010). Games, Stephen (ed.). Betjeman's England. Hachette UK. ISBN 9781848543805. ^ Goffin, Magdalen (2005). "4 The Watkin path". The Watkin path : an approach to belief. Brighton: Sussex Academic Press. pp. 23–25. ISBN 9781845191283. ^ "A History of the County of Middlesex". English History Online. 1971. pp. 198–203. Archived from the original on 28 September 2007. ^ a b "Metropolitan Line". Clive's UndergrounD Line Guides. Archived from the original on 11 May 2000. ^ Horne, Mike (2003). The Metropolitan line. Capital Transport. pp. 19–20. ISBN 1854142755. ^ Rose, Douglas (1999). The London Underground, A Diagrammatic History. Douglas Rose. ISBN 1-85414-219-4. ^ Jackson, Alan A. (1986). London's metropolitan railway. Newton Abbot: David & Charles. pp. 241–242. ISBN 0715388398. ^ De Lisle, Tim (14 March 2006). "The Height of Ambition". The Guardian. Archived from the original on 22 March 2009. ^ "Bakerloo Line". Clive's UndergrounD Line Guides. Archived from the original on 3 March 2000. Wikimedia Commons has media related to Wembley Park tube station. "Regeneration of Wembley Park tube station". 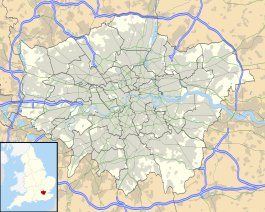 London Borough of Brent. Archived from the original on 27 August 2006. "Wembley Park". Tube Photos. Archived from the original on 3 October 2011.